I have a friend (Liz) who is adamant that the method for making Greek yogurt with your Instant Pot that I wrote about a while ago is far too complicated. So much so, she hasn’t even attempted it. Now, I normally concede if someone tells me a method I’ve written is unclear but as it became second nature to me really quickly and further streamlining seemed impossible, I didn’t try very hard to reinvent it (sorry Liz!). Following that, a few readers asked me what I knew about using UHT milk to make yogurt. Apparently, it cut out a fair few steps compared to ordinary milk so went all wannabe-food-scientist and started researching how to do it. 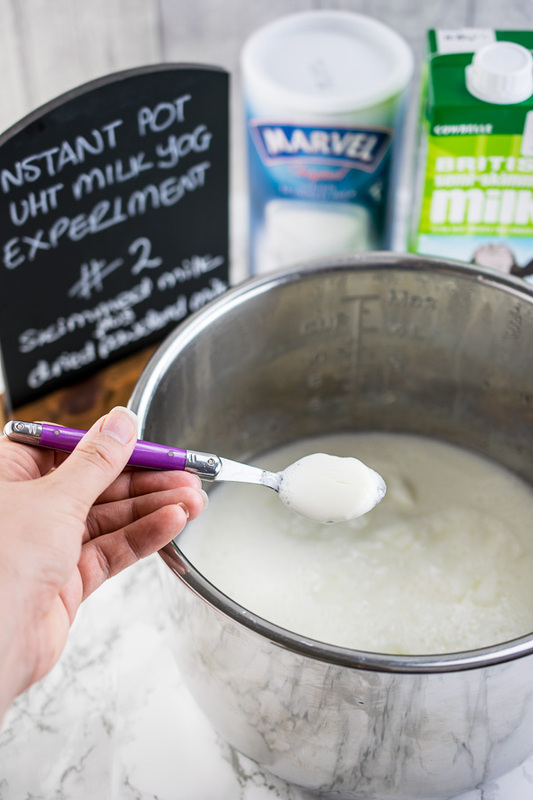 I’m now sharing my results for how to make brilliant (and easy) Instant Pot UHT Milk Yogurt. 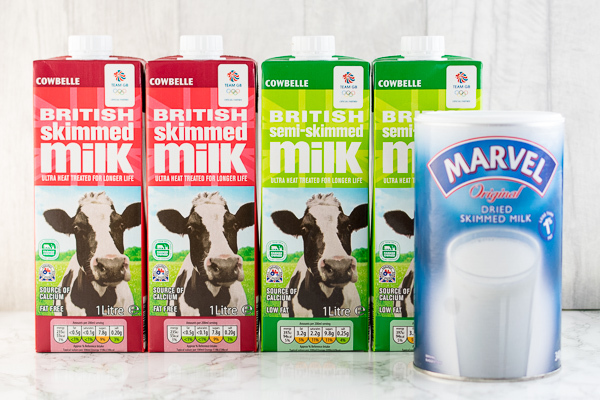 I started by finding out what exactly UHT milk is, as I realised, I didn’t actually know and I had been shunning this long-life milk product without finding out anything about it. UHT stands for “Ultra High Temperature” and the difference between it and pasteurised milk is that it is heated to the point it is actually sterile. That means there are no live microorganisms in it after its processing is complete. 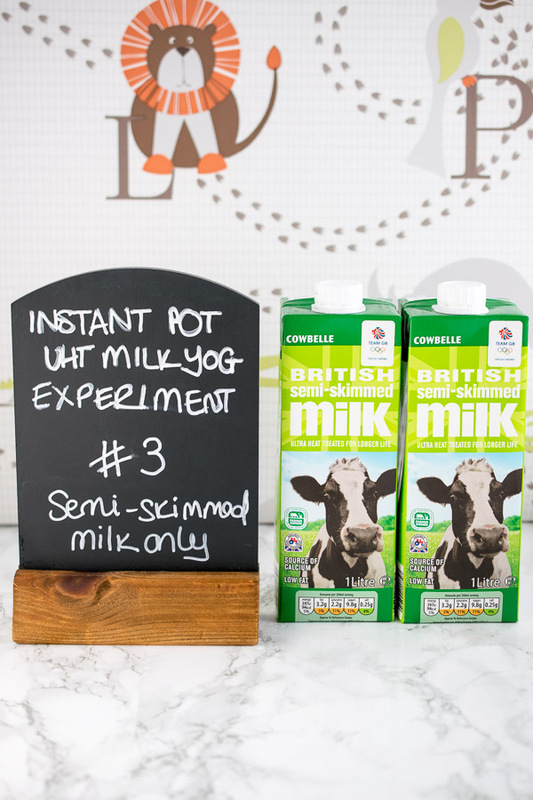 Pasteurised milk (more commonly referred to as “fresh” milk in the UK) has been heated to a lower temperature meaning that bacteria which cause the milk to go off (“spoilage”) remain and therefore, it must be chilled and used within about a week. UHT milk can remain unopened in your cupboard for almost a year. Now, we need to take a brief look at the process of making your own yogurt. The whole point of heating and cooling fresh milk before adding in a small amount of live cultured yogurt (referred to as “inoculation”) is to kill the microorganisms in this fresh milk before incubating it in your Instant Pot at a constant temperature until it is set. Logic, therefore, tells us that you can cut this whole palaver out if you substitute fresh for UHT (i.e. sterile, meaning no live microbes within) milk and go straight to inoculation and incubation. Let’s see what my results were after I got all mad scientist and concocted an experiment in homemade UHT yogurt making! My rationale was – if UHT milk produces good tasting, well-set yogurt reliably, then why should we not use it? 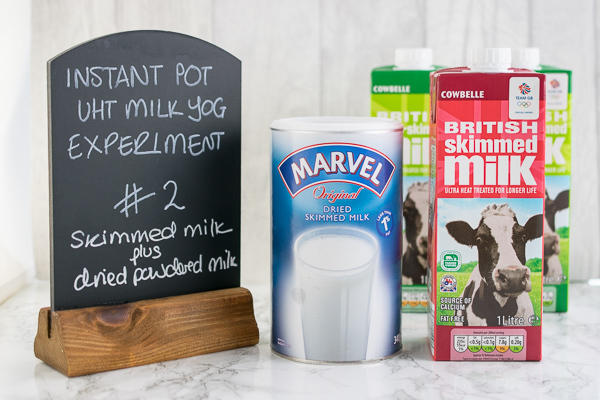 It is vastly cheaper than fresh milk is at around 49p per litre (from Aldi) and I’d also heard that adding milk powder could thicken the yogurt to the degree that you don’t need to strain it, meaning even more time saved. … and after 10 hours of incubation, it had not set! It had started to thicken but wasn’t anywhere near truly set so I whisked it well and gave it another 10 hours. And it set very well indeed. You can see from the photo above how creamy it was and how the whey had split from the yogurt so it only needed to be strained very briefly. Taste wise, it otherwise yielded a tart but thick and creamy yogurt with twice the volume of whey to yogurt after straining for about 10 minutes. The tartness comes from the very long incubation period as it hadn’t set in the time. 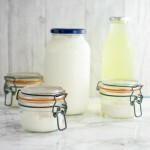 Note that some homemade yogurt recipes go up to 20-22 hours so it’s not “wrong” to leave it that long but from a food safety point of view, I’d not want dairy products sitting out much longer than 20-22 hours so if yours doesn’t set in that time, then I’d discard it and start again. Next experiment, I added some dried skimmed milk powder to a little of the milk and the yogurt starter, then gave it the 10 hours incubation. It set perfectly and was much thicker than the plain version from Experiment One. P.s. I got this milk powder in Waitrose but larger supermarkets usually have it (we aren’t near many large stores, just a few “local” ones which don’t carry much variety of anything really). 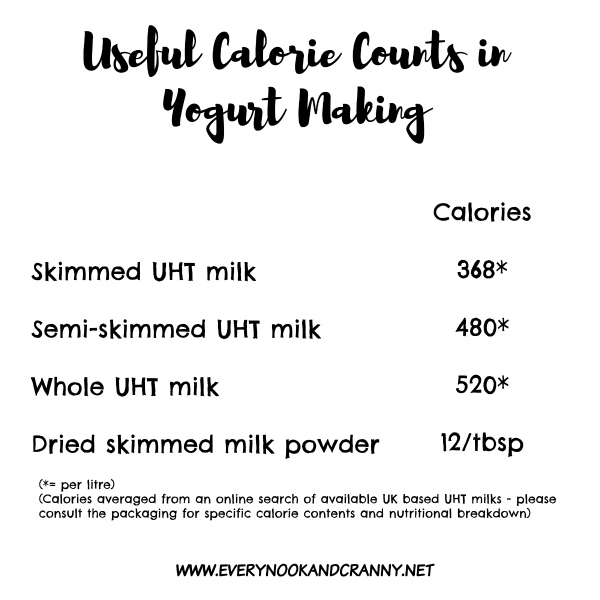 If you want a low-calorie yogurt that requires little or no straining to get to your desired thickness, then UHT skimmed milk plus dried milk powder may be the way to go for you. For me personally, I like it much thicker and a little creamier in taste. Whether UHT or pasteurised, I find skimmed milk yogurt is always a little tarter/sharper in its taste which is no surprise, given how little fat there is to round out the flavour. Experiment 3 was plain semi-skimmed UHT milk. 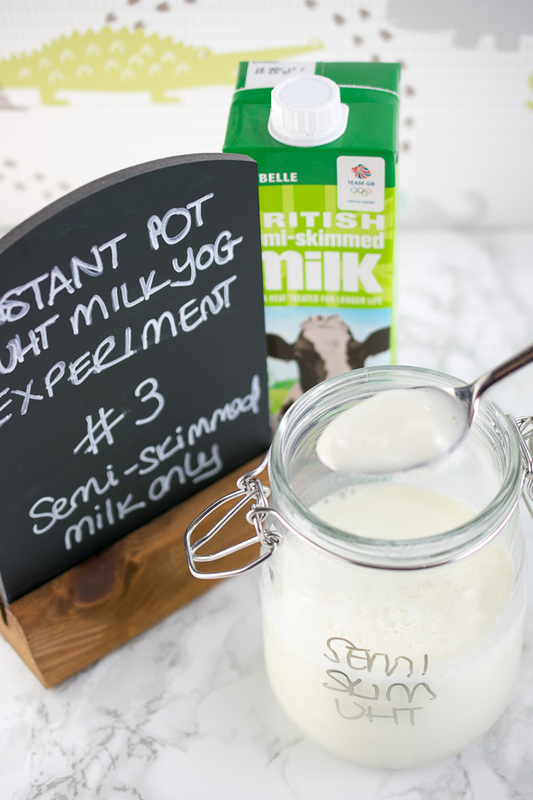 When I make yogurt by a more traditional method, I most often use semi-skimmed pasteurised milk so I was keen to see how this one tasted and also what texture it came out using UHT. Result? Well, it was set, but softly so and required straining to get it good and thick in texture. Plus, I realised that you really do need to make sure that the milk powder is fully dissolved before you add it to the milk or it will give you grainy yogurt that no amount of whisking and straining will completely sort out. It was, however, otherwise comparable in taste and texture (after straining) to my ordinary yogurt recipe. … actually, it really isn’t far off! This time, I would be hard pushed to tell it apart from my pasteurised milk version. The interesting finding I do have though, having done this quite a few times now, is that I find yogurt which has added milk powder needs a longer straining period. I must look into the science behind it, but there appears to be something which makes the yogurt so stable and thick, that it can take 8-10 hours of straining (in the fridge) to end up with Greek-style yogurt. With pasteurised milk, this takes me hardly more than 15-20 minutes meaning I can do the straining on the countertop before chilling the finished yogurt. 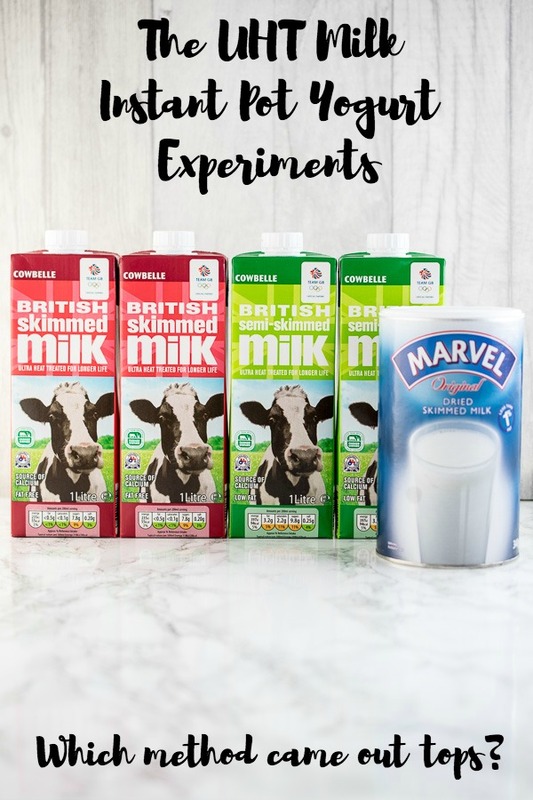 Interesting stuff indeed and it seems to fit with the experiences of my friends who have tried similar UHT/milk powder yogurt recipes before. Do remember if you are straining out the whey, you are losing a few calories with it but the remaining yogurt becomes more concentrated and therefore it has relatively more calories, spoon for spoon. But I really am getting pedantic there so let’s leave it at that! Also, think about what you want the yogurt for. Things like smoothies or milkshakes may be better with runny yogurt but to make salad dressings or tzatziki, the thicker the better. But of course, there is the matter of taste. 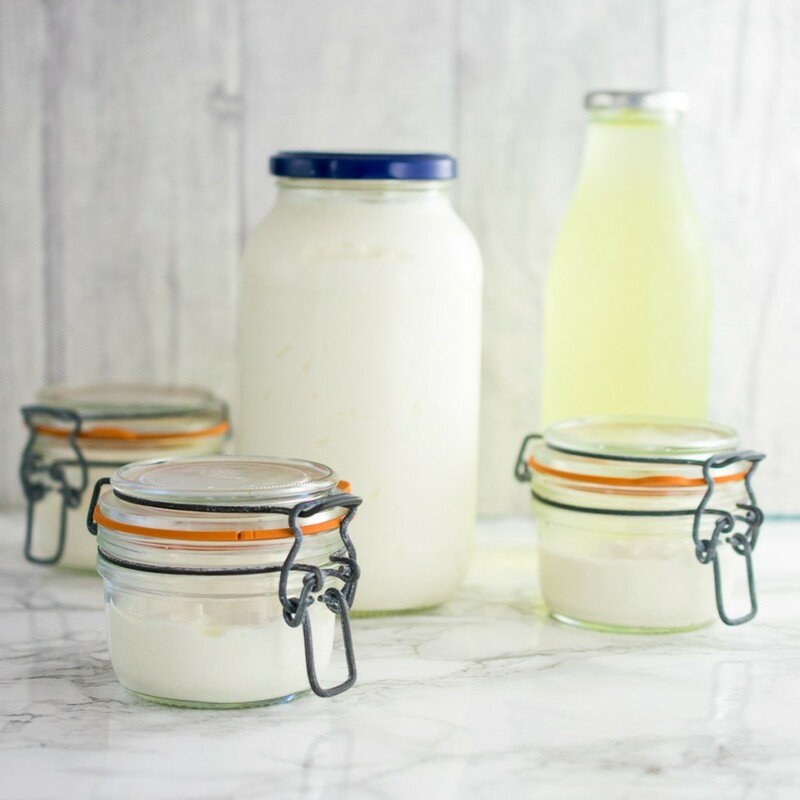 You may prefer really tangy yogurt in which case you can incubate it longer (say up to 12 hours) or leave it a week before eating, in a sterile jar in the fridge as it will get sourer tasting the older it is. 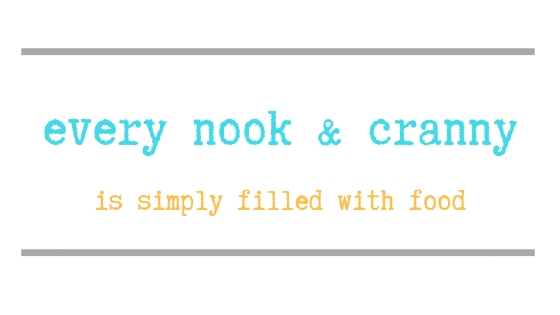 If you like it more creamy, incubate for 8 hours and use quickly. If using dried milk powder, you must make sure it is dissolved before adding to the liquid milk or the yogurt will be grainy. I whisk it with a little of the UHT then zap on low for 30 seconds in the microwave and allow to cool to room temperature before using so not to kill the live culture in your yogurt. If it doesn’t set the first time, give it a very very good whisk and try once again with a further incubation of up to 10 hours immediately. If it doesn’t set, the yogurt culture is likely to be dead – discard your attempt and chalk it up to experience. I use a little of the yogurt from the batch before as my starter but have had good results with Yeo Valley Natural Yogurt, available in small little single serve pots. Other good ones are Fage 0%, 2% or Total Greek Yogurts. Rachel’s Natural Yogurt is also good. Basically look for a plain yogurt with “live cultures”. Make sure your Instant Pot is spotless before starting and consider steaming it before starting to sterilise the inner pot and inside of the lid. Simply clean it, add 250 ml water to the inner pot and pop the lid on with the valve closed and give it 5 mins on Manual High with a QPR before carrying on with the recipe below. Congratulations on reaching the end of this mammoth post and for all my friends and readers who felt like Liz, that it is just too much faff to make yogurt using your Instant Pot… I hope I’ve convinced you it is very easy, adaptable to your preferences and yields just as good a result as more long-winded pasteurised milk versions do. 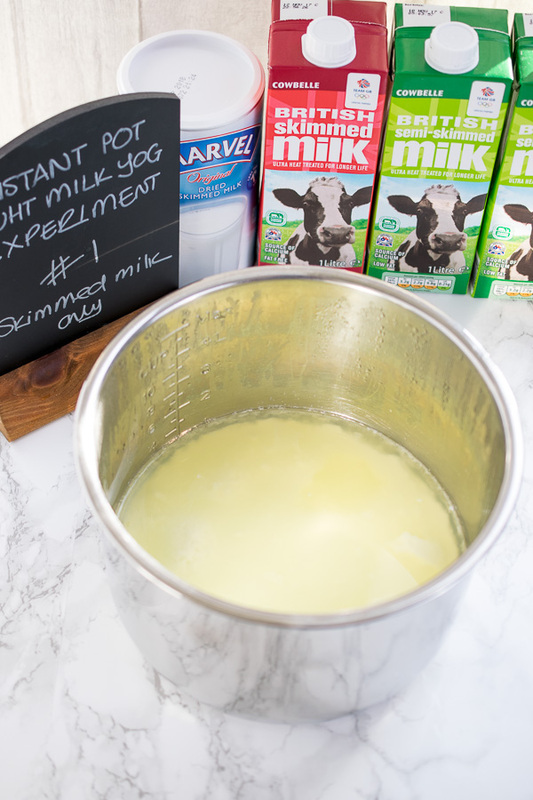 If you want a super simple and hands free homemade yogurt recipe, using your Instant Pot, then this is the one for you! Whisk the yogurt starter with a little milk and then add to the Inner Pot and whisk very, very well to combine. This is very important to ensure a good and even set. If using dried milk powder, put it in a small heatproof bowl and whisk in 2tbsp of the UHT milk you are using. Zap in the microwave on low for 30 seconds to ensure it has dissolved and allow to cool before using. 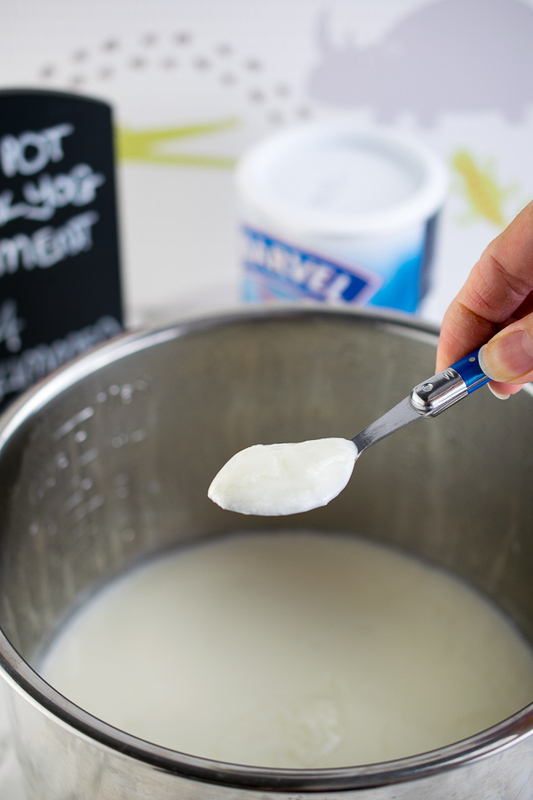 When at room temp, whisk in the yogurt and add the lot to the inner pot with the rest of the litre of your UHT milk. 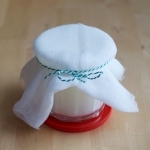 When finished, transfer to sterilised jars and chill or strain through a sieve lined with a few layers of kitchen roll or cheesecloth to remove as much whey as you like. Use within two weeks and keep refrigerated for that time. 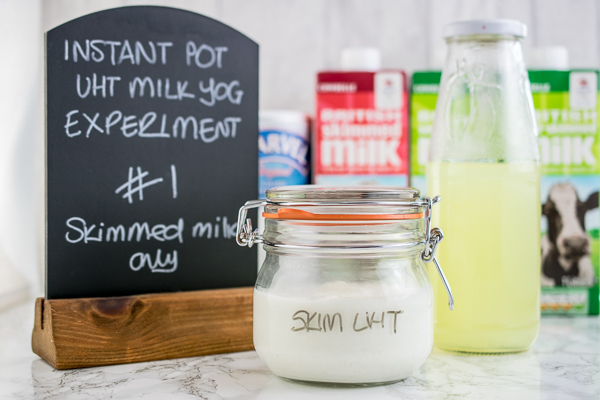 You can use skimmed, semi- or full-fat UHT milk to make yogurt with. Skimmed is more tart whereas full-fat is very rich, smooth and creamy. Dried milk powder thickens up the yogurt considerably - only if you like super thick, Greek-style yogurt do you need to strain it. If straining whey for a long period of time or it is very hot weather, do it in the fridge. Sterilise your glass jars and their lids by running through the dishwasher on hot after making sure there is no food inside them. Do not touch the insides so not to contaminate them with microbes from your hands which could lead to spoilage. Thank you for sharing 🙂 This is exactly what I had had been waiting for. I recently started making yogurt in the IP. I like my yogurt *really* thick and I strain for several hours or overnight. I first used fresh, full-fat milk (€ ouch!) and the results were fantastic. Then one day I couldn’t find fresh f-f milk in the shop and did the *whole process* with UHT f-f milk and got excellent results too. When my local shop ran a special offer on semi-skimmed UHT which was too good to ignore, I found myself with 16 litres to experiment with! Thanks to your efforts I now have the definite recipe, and I will try it as soon as the current batch is eaten! I used 1 litre (± 4 cups) of semi-skimmed UHT milk, heated some of it to around 40°C (104°F) before thoroughly mixing 2 tbsp of dried milk powder (I used a stick blender! ), then added 2 tbsp of a recently-made batch of yogurt, before mixing everything back together in a lidded container ready for the IP. I left the yogurt mixture to ferment in the IP for 14 hours, then set it outside to cool (it is cold enough at the moment!) then left it in the refrigerator before straining. On removing the lid, I saw that a light and barely-grainy layer had settled on the surface as well as at the bottom of the container. I have said in my previous comment that I like a *really* thick yogurt and I wanted to know how much whey would drain in order to get there; after about 6 hours, I measured 500ml (± 2 cups) of whey and the same of thick, creamy yogurt. The whey is clear and pale, a definite improvement from the cream-like whey of my previous attempts. I believe that cooling before straining helped. Once whisked with a fork, the yogurt is thick, shiny and creamy. The taste is rich and not sharp at all. 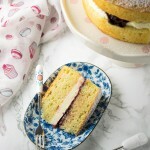 In all its aspects, it reminds me of mascarpone! 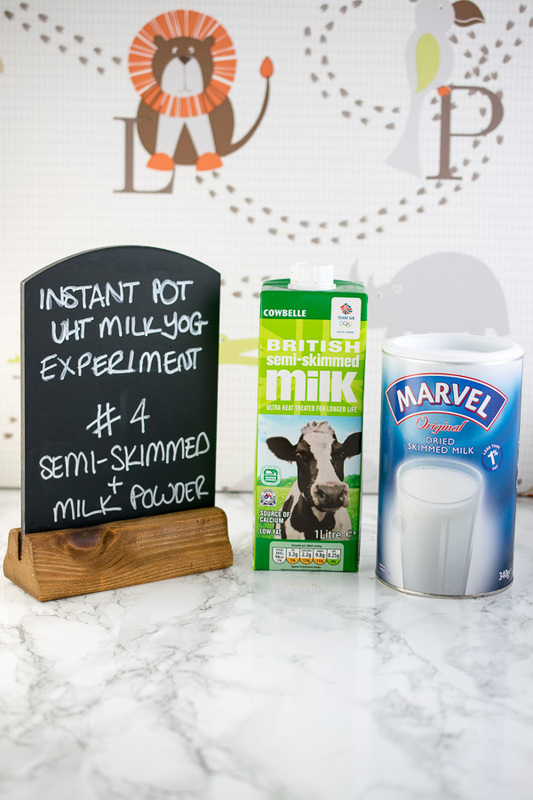 All in all, this recipe has been a huge improvement on my previous attempts with UHT milk. I had been tinkering around before, and this has given me a clear outline. I would still like to reduce the amount of whey to the same ratio I get with fresh full-fat milk, which is around ⅓ or less. Increasing the amount of dried milk powder might help. UHT actually stands for Ultra Heat Treated so you might want to change that on your website. Hi Yvonne – thank you, I’m really glad you enjoyed reading my post. UHT can mean either Ultra High Temperature or Ultra Heat Treatment though, it’s referred to as either in both academic and more informal texts interchangeably. I used 1 litre of full-fat HUT and heated ¼ of it to ± 45°C before mixing 50g of dried milk powder and 2 tbsp of the previous batch of yogurt. After incubating (12 hours), cooling and straining (overnight), I measured 300 ml of whey , just under ⅓ of the total liquid I started with. To be honest, the difference was apparent as soon as the yogurt was fully incubated. It was very firm and I did not need to spoon it out to strain it as it just ‘plopped’ out in a single mass without leaving anything behind. The strained yogurt is very, firm, rich and creamy. No tartness, but I did not find any tartness in the semi-skimmed batch either. 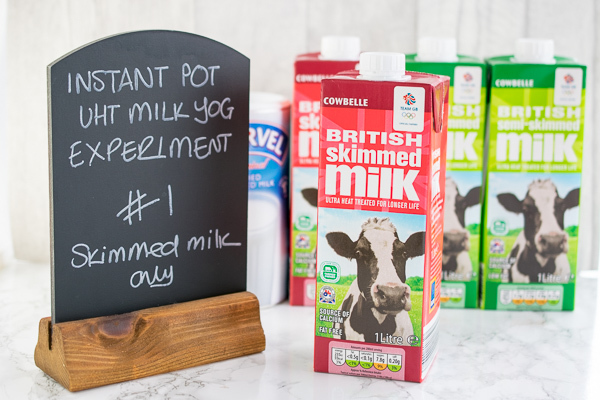 Based on on this, I think I will add 100g of dried milk powder when using up the semi-skimmed UHT milk I still have left, to ensure a firmer, richer batch. Hopefully, this will also help reduce the amount of whey to 300ml as when using full-fat milk. You’re so very welcome. And thank you for keeping the feedback coming – it will only help readers to work out how best they like their own yogurt! I’ve been using UHT milk for yogurt for at least a decade now (in the USA we can also buy UHT milk in the refrigerator section as “ultra pasteurized”). I don’t use my Instant Pot since I have an Excalibur dehydrator and can make yogurt directly in glass quart jars using the dehydrator as the incubator. However, I wanted to comment since I recently used some leftover half and half to make yogurt, and was surprised to make the thickest, creamiest yogurt ever! There is zero need for straining. Of course, the calorie count is higher, but I just reduce the serving size since it is so satisfying. I think in Britain half and half is called half cream; single cream would be too rich, unless you cut it with milk. You’re looking for about 12% milk fat. Hi, I’ve been making UHT milk yoghurt for a while now. I have an aldi esky-style yoghurt maker. about a tablespoon of the previous batch of yoghurt. My initial starter was a packet mix yoghurt. The third of a cup of powdered milk makes for a very thick yoghurt that is practically solid in the pot, so I don’t strain it further. I have recently purchased a kefirko cheese maker that I do use to strain the yoghurt and press it (with a fairly light spring that comes with the cheese maker) to make yoghurt cheese. My wasabi yoghurt cheese was a smash hit, and gone in a week.